State Legislators and State Senators receive distinctive license plates to use on their vehicles while they are serving their term. The "Top Six" state officials also display special plates with the "Official" legend. #1- Governor, #2- Lieutenant Governor, #3- Secretary of State, #4- State Treasurer, #5- Attorney General and #6- Comptroller. Starting sometime in the 1930s State Legislators and Senators received attachments to display atop their license plates. There were yellow on dark blue ones, and later dark blue on white. Yellow on dark blue attachments are known for the 1951 Senate with the district number in the lower right. In 1955, black on white porcelain plates featuring the state seal were issued, and validated with the 1955 passenger tab. These were only used for one session, and replaced by a black on white porcelain topper for 1957. In 1959, full-sized white on blue plates were introduced, with the "Legislature" and "Senate" captions. These were used until 1967, when flat screened blue on white plates featuring the state seal were issued. Through many slight variations these plates are still used today. Variants are also issued for ranking officials such as Speaker of the House, Majority Leader, etc. These feature the title spelled out in addition to the district number. Some of these types are also issued on the "Preserve the Sound" base, though completely flat. Porcelain plates were used for the 1955 and 1956 Legislature and Senate plates. 1959-60 topper, black on white porcelain. A note on the back of this indicates it belonged to Andrew Repko. He was elected as Representative of the 35th district in 1953, serving for 14 years. 1967 State Legislature, with a nice low number. Another 1967, but at the other end of the numbering spectrum. This is a ca. 1966 issue, it has no tab slots. The background of this plate is reflectorized, but it held up about as well as the reflective Polyvend plates of the same era. 1980 State Legislature 1981 State Legislature - second car. 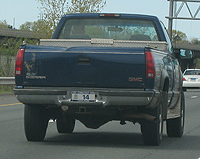 The 1980 and 1981 plates were actually both used at the same time, but there was no 1981 sticker for the front plate, as Connecticut went to single plates that year. ca. 1940s/1950s cast aluminum license plate topper. These '30' plates are again from Adela Eads. After 4 years in the House of Representatives, she was elected to the State Senate. Those who are in leadership positions receive these more descriptive plates once in their new position. These are then used instead of the normal Senate plates. In this session the Republicans were the minority party in the Senate. The Republicans became the majority party. These plates are issued with the 'A' suffix as well. 1998 State Senate 1998 State Senate Republican Leader. The party name was now spelled out on the plates instead of 'Majority' or 'Minority'; saving those in the minority party the shame of being identified as such. 2001 State Senate 2001 State Senate Republican Leader. Dell Eads passed away on July 8, 2003 at the age of 83. I was fortunate enough to obtain this set of plates from someone who purchased them at an estate sale. A few got away before I had the chance to pick up the lot, but I am glad to have the opportunity to keep most of this set together. 2001. These are also issued on the "Preserve the Sound" base. A State Constitutional Convention was held in Connecticut from July 1, 1965 through October 28, 1965. There were 84 total delegates, 42 from each party. The primary purpose of the Convention was to rewrite the Article of the State Constitution that dealt with representation in the legislative districts- though other matters were also addressed. This plate design then became the basis for Legislature and Senate plates.